This is my Home-Studio and Sancuary. I live and work from Bonaire, Georgia, and I've been an established artist since 2002. 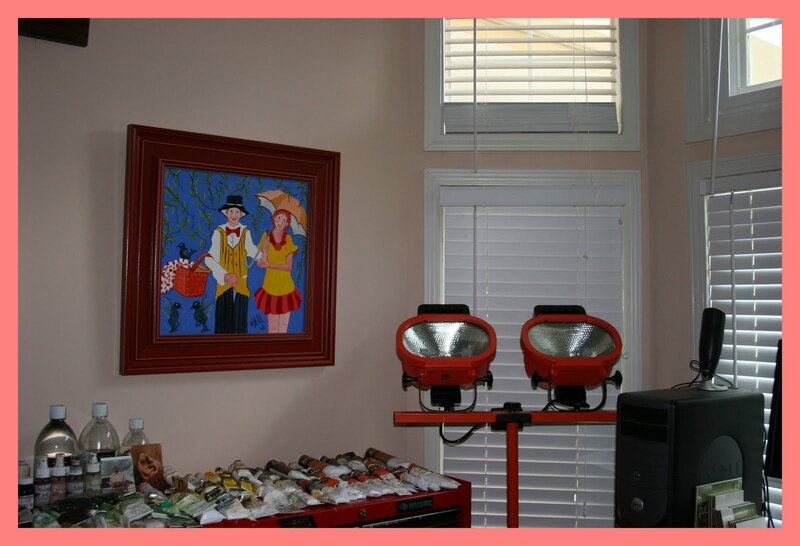 In August of 2008, together with my sweet husband Robert, we formed our small company "Dimples & Dragonflies". I began my career with Primary Concentration on Children's Themed Art. But it's always exciting to explore other Disciplines, these days I play around with them all and Most Recently I've discovered Decorative Solder and Glass. 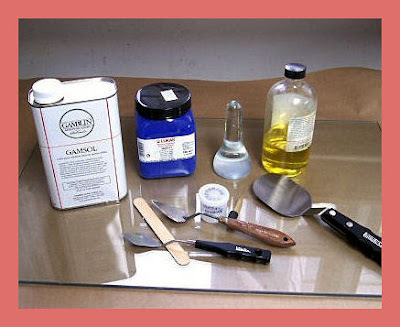 When using Oils..these are some of my tools of the trade. Good Lighting is Essential. I actually use contractor tripod lights when I really need to detail a canvas. They're FABULOUS! And Storage is a MUST HAVE. I use mechanic toolboxes (with rubber rolling feet) for much of my supplies. I'm forever chasing the light when I'm painting and these handy lit'l guys move easily with me. 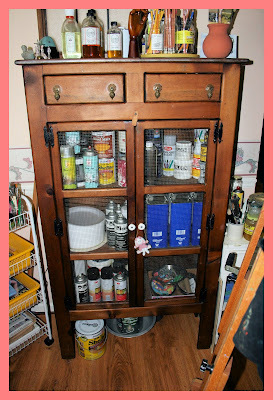 I use this cute pie-safe cabinet to store things I need to get to often. It's just nicer at the end of the day, to have a place to properly store things so you know exactly where they are the next time you need them. Now my tools for Decorative Soldering are quite different from my needs within oil painting. To me, things are a whole lot messier and so I've set my Soldering Bench up in a Cubby Hole away from anything I don't want to see burned or damaged in any manner. 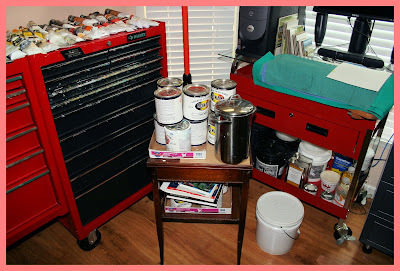 I also keep my working space as simple and as organized as possible. Clutter presents all kinds of complications. When Soldering, it's important to be aware of your surroundings and to watch where you point your Soldering Iron at all times. I also think it's important to use the Purest Quality Solder made available on the market. 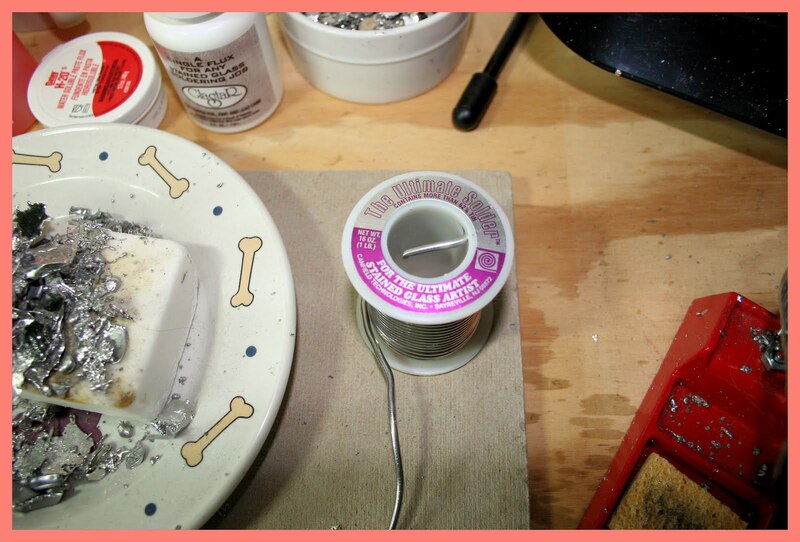 Any Solder-Artist will tell you, the best Solder is one one that has a Clean Flow. You get your most accurate pattern capabilities as well as whatever project you're working on will be guaranteed to have a long and beautiful life. If anyone is still with me..having made it this far..I'd like to say one of the best parts of being an artist is that you get to decorate your home with all your work. 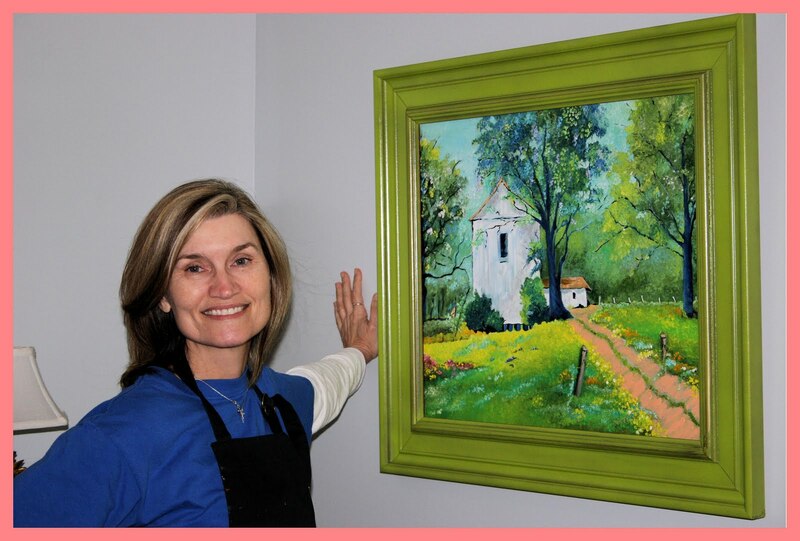 I rotate my pieces often and it helps keep things within my environment fresh and exciting. Okay, that about wraps it up for my Initial "In The Studio" Tour for this First Friday. In the coming days, I'll take newer photos and share more of myself and my work. A Special Thanks to anyone who may have visited me today! I'm sitting here laughing myself silly! This is a sure sign I've been spending way too much time in the studio... Actually woke up thinking it was FRIDAY. Oh well..at least I'm ready for tomorrow's link up. Thank you for the tour of your wonderful Art Space. I like that you have it so organised. I think that is one of the key elements to making great Art. I love how you set up your lighting and how you can move it to any angle that you need to. Your art is so vibrant and happy!! I love it all!!! Yes my art work is working it's way out of my craft room now as well!! My family does not mind so thats good!! Hugs and Smiles Dear Lady! 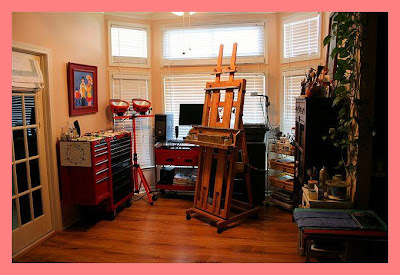 Great post about your studio and all of your tools you use! I'm a follower! And thanks for visiting me and commenting...it really means a lot to me! I loved the tour though :) It is awesome to see where you work and how you make your beautiful pieces of art. Terri, thanks for stopping by. I had bookmarked your post from yesterday to stop by your place. Such a wonderful and challenging commitment to care for your mother. I pray that God continue to provide you with the strength and joy that seem to be present in your life. Your workspace is amazing. I'm quite surprised at all the supplies necessary to do your art. I guess I never really thought about it. You are indeed an expert...you put out some of the most beautiful pieces I've ever seen. This was a great post. I love the tour. I did find you in my feeds today...maybe the problem is fixed! Hi Terri, so nice to meet you. Great studio and awesome artwork! you use of color is beautiful. Thanks for sharing and I look forward to getting to know you more. LOVE your space!! so functional, but yet, sooo pretty! ;) thanks for stopping by. 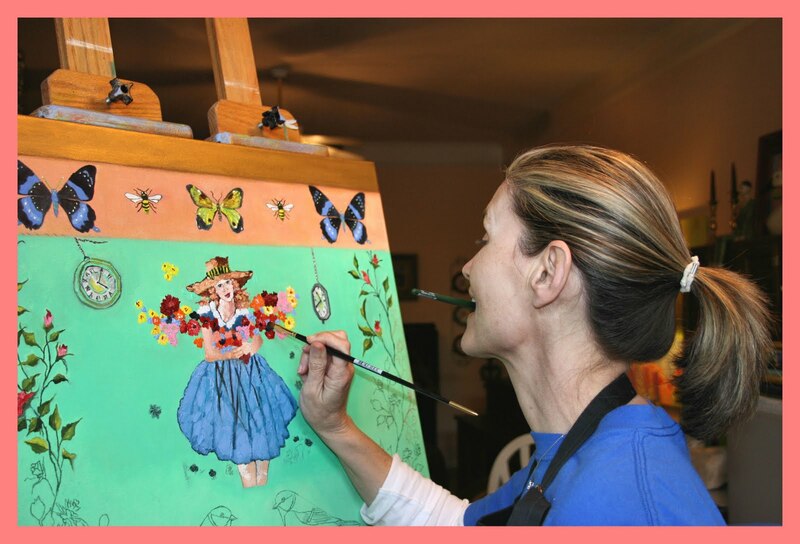 looking forward to sharing our more creative sides with each other on fridays! Nice to meet you Terri, Thanks for shareN ... I love the white house paintN. Oh... loved the tour of all your goodies in your wonderful studio!! Do those big lights get hot? I could use better lighting. 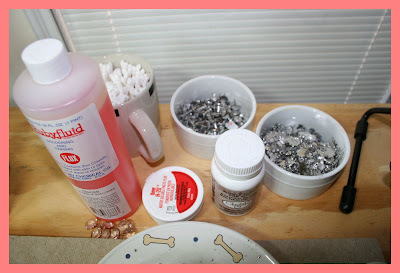 I have gotten some supplies for soldering... it is really something I have been wanting to try! I just need to find the time to start playing! 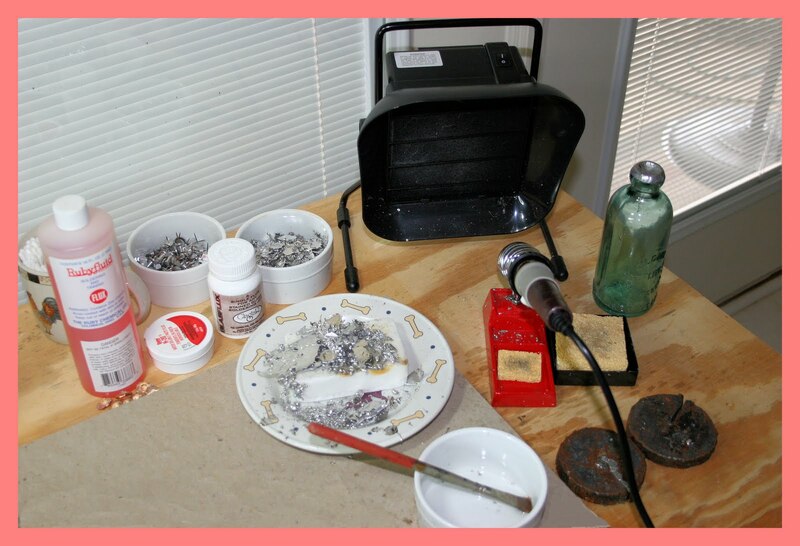 How did you learn to solder... or did you just jump in? Hey Terri ... just popped over from sneak peek friday. Love your studio ... it looks huge! It looks like you have all of the best tools and supplies. Thanks for sharing! 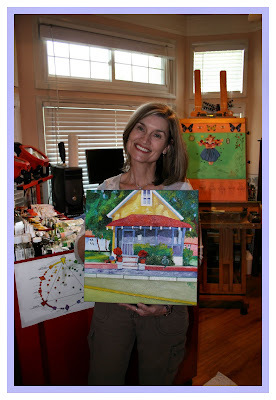 Hi Terri, So nice to meet another creative soul. Thanks for the tour. Looking forward to seeing more of your work. Hi Terri, Thanks for stopping by my blog & for your cute puppy comment. I LOVE YOUR ARTWORK! I'm a fan. I've told people about you. Wish we lived in the same city so we could hang out or go to lunch! I'm catching up on so many blog posts I've missed and I have to say this one tickles my toes! 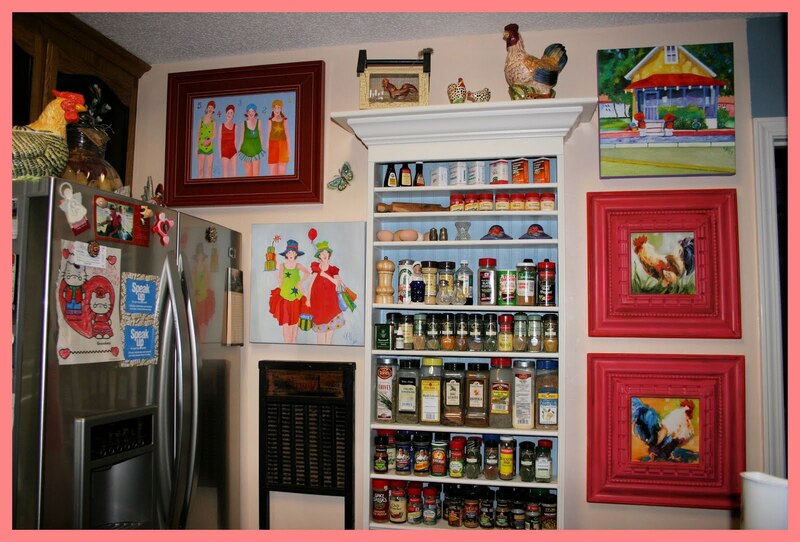 I'm so in love with your studio area, your kitchen, all the gorgeous artwork of yours you have all over your house!! I need to get painting, you are such an inspiration I want to be you when I grow up! lol. Ok, I know, I am grown up, but you know what I mean! !